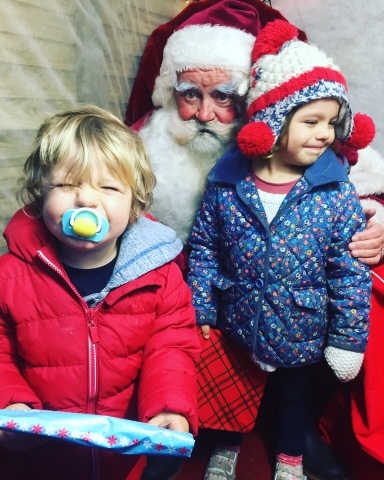 This year is such a special year for my children, with the little ones growing up and the eldest hanging onto believing into Father Christmas everything feels so special. My daughter is overjoyed thinking about Christmas every day she asks if that's the day. She can't wait to start her Advent calander and is loving learning about the nativity and baby Jesus as she calls it. Yesterday we were at a village Christmas fair, it was rather busy with rides and stalls but there was one thing we couldn't get Ami away from and that was seeing Father Christmas. When she spotted him in his makeshift grotto that was it we were waiting however long. Even Son son was excited. As we moved along the queue we had to hold Ami up over the gate so she could catch a glimpse of Father Christmas. Asti didn't want to see Father Christmas he is far too cool now days. He knew it was his old infant school governor but still went along for the crack of it for his siblings. He did enjoy the snow machine that went off every now and then. We asked Son Son if he wanted to see Father Christmas but he said no but when we got near he did come out the pushchair as we got nearer. Ami on the other hand was so excited she jabbed an elf in the tummy for some reason. It was finally our turn and just Ami and Son son went in, Ami asked for a baby and then she said "my brother Son Son wants a car and can you get some minecraft toys for Asti please" which I thought was very sweet. Son Son was so pleased he got a present he would not let go of it till we got home and he opened it, even on some of the rides he wouldn't let go. It was a lovely moment well worth braving the strong winds and high volume crowds. It's such a special time as a child I remember it so much from my own childhood, I really do love Christmas.